Residential Life at SF State is fighting back against a constant swarm of mosquito attacks that have plagued University Park North residence halls for years by planting mint-plant gardens to repel the insects. “My left eye looks like I got socked in the face,” said UPN resident Candy Cheatham, whose face is swollen from mosquito bites and does not want to attend class because she is embarrassed. Her roommate Deedee Crawford said visits from the exterminator were futile as their mosquito problem persists. UPN Gardening specialist, Linda Jo Morton, holds the mint plants that will be planted as what she called a homeopathic and ecologically sound way to repel the mosquitos in University Park North, Monday, Oct. 6, 2014. Xpress / Lorisa Salvatin. 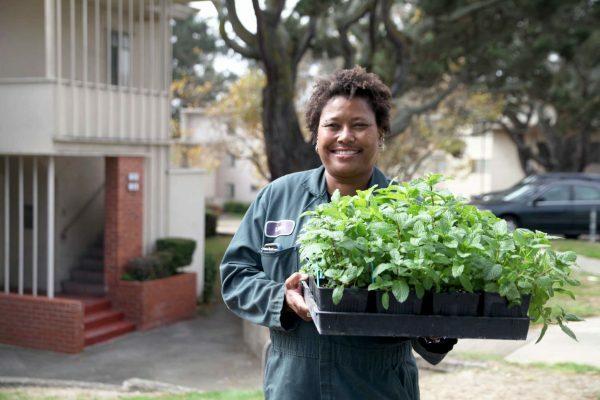 UPN resident assistant Carmie Javier is spearheading Minty Fresh Beginnings, a Residential Life program she planned after learning that mentha plants provide a cheap and natural alternative for repelling mosquitoes. The University agreed to provide the necessary tools and plants for the garden, so long as Residential Life provided the people to do the work, according to Javier. They plan to cultivate the garden behind 175 Buckingham Way with two mentha plant varieties, Chocolate Mint and Kentucky Colonel. But the mentha plants alone will not ward off mosquitoes, according to Linda Jo Morton, the gardening specialist for University housing. Rather, mosquitoes are driven away by the burning smell of dry mentha plants. “I am skeptical,” said lecturer John R. Blair, commenting on the effectiveness of the plants in taming the mosquito problem. Blair teaches the World of Plants course at SF State and had not heard that mentha plants repelled mosquitoes. He said the most effective ways to deal with mosquito insects are to either get rid of stagnant water, a common breeding ground for mosquitoes, or to use repellents to prevent female mosquitoes from biting. “The main thing about mosquitoes is that they breed in water,” said Student Health Services Director Alastair Smith, who advised people to protect themselves from mosquito bites by using repellents or wearing long sleeves and pants. In July 2013, a former RA named Jamie Robbins tried to organize a program that involved filing complaints en masse to the Department of Public Health, pressuring the University to fix the problem. But when Robbins transferred to another job position, she dropped the effort altogether. “It’s so much worse than you think,” said marketing student Chris Leicester who moved out from UPN after multiple complaints to management and monthly visits from pest control. Javier hopes the garden will be useful to residents as teas and home-cooked meals even if the mentha plants do not eliminate the mosquitoes.